Circa 1854. Several doctors have lived in this pre-Civil War home. 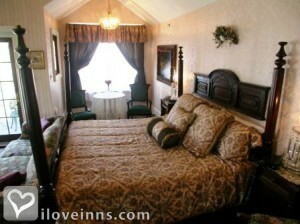 Each of the romantic guest rooms is named after a doctor and includes a working fireplace, many with a whirlpool tub. 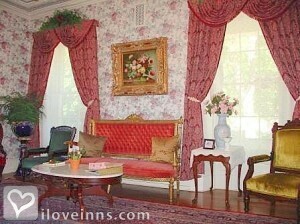 There is an emphasis on health here, and the inn includes a spa with sauna, massage and exercise equipment. The inn features a fine Italian restaurant, Carmelle, and serves a variety of gourmet fare; the desserts are especially noteworthy. Payment Types Accepted Include Visa, Discover, American Express, Travelers Checks and Master Card. This property has 10 total guest accommodations, 8 with private bath, 10 with fireplaces, 6 with whirlpools, 2 total suites, including 1 three-bedroom suite. The types of beds available include Queen, Double and King. 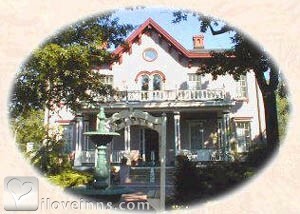 $25.00 per night small(up to 40 lbs. )pet fee. 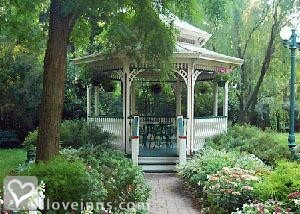 Almost 2 Acres of lush gardens with a picturesque gazebo, fountain and small ornamental bridge. Reservations can be canceled and deposits refunded only if canceled at least 14 days before the scheduled arrival date. A $25 handling fee will be deducted. No refunds for cancellations less than 14 days prior to scheduled arrival.